A couple weeks ago I decided it was time to get my nails back! 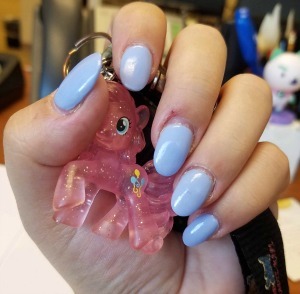 I'm a horrid nail biter and I wanted to start growing my natural nail out - I can only seem to hold off gnawing my nails off by getting acrylics. So I did! And I went with an almond shape instead of the a square shape and chose a super pretty periwinkle color. Please excuse the growth this is almost a week after they were done! I'm super in love with this length and the color - I just need color recommendations for the next time!